Geofences are virtual boundaries that you can designate for tracking your vehicle. Geofences can be drawn as circles, rectangles or custom shapes. 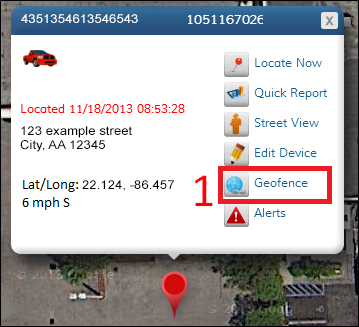 Once a Geofence is set up, you can add alerts or track when your vehicle enters or leaves that area. 1. Click the ‘Geofence’ icon.